On Thursday, Border Patrol agents shot and killed a man who authorities say failed to stop for inspection at a Sierra Blanca checkpoint and then fled east for 30 miles on I-10. 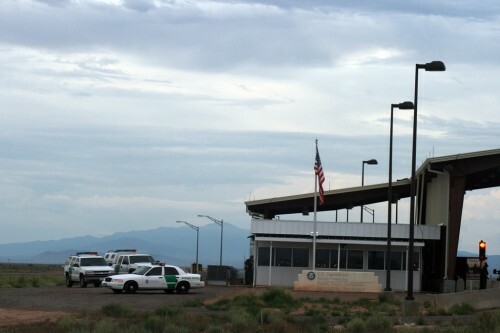 U.S. Customs and Border Protection (CBP) said Friday the man had pulled into the Border Patrol’s checkpoint line in Hudspeth County around 4:45 p.m Thursday, but failed to stop for inspection and quickly fled. According to a statement from CBP, Border Patrol agents followed the vehicle for 30 miles until it stopped. The man was later pronounced dead by a Justice of the Peace dispatched to the scene. None of the Border Patrol agents were injured. CBP says a “pistol-shaped pellet gun” was found in the man’s vehicle. The agency has so far not released the identities of the man killed or the agents involved. Details about the weapon being spotted – such as whether the man was holding the weapon when fired upon, or whether agents observed it somewhere in the vehicle – have also not been released. The FBI is investigating the incident, along with CBP’s Office of Internal Affairs and the Department of Homeland Security’s Office of Inspector General. The incident marks the second fatal Border Patrol shooting in Texas in a week. Early Wednesday, Border Patrol authorities in the agency’s Rio Grande Valley Sector of South Texas said a suspected drug smuggler was shot and killed on the U.S. side of the border with Mexico when a Border Patrol agent came under fire. The agency said electronic surveillance tipped the agents off to drug smugglers traveling near the small Texas town of Chapeño. Agents dispatched to the scene found an estimated 800 pounds of abandoned drugs. Four suspected smugglers were arrested, while another was shot and killed after engaging in a shootout with an agent. This entry was posted in KRTS News and tagged Border Patrol, Border Patrol Shooting, Border Security, Crime, Hudpseth County, Law Enforcement, Sierra Blanca, U.S. Customs and Border Protection. Bookmark the permalink.